This guide is written per SFv31, so if you're working in a future version -- you may have a slightly different menu structure. If you are new to Salesforce, you may want to create an account at http://developer.salesforce.com. This will allow you to create a developer ORG, which you may use to develop SF applications. Apex is a case-insensitive and stripped version of Java programming language without standard Java libraries (except for Math), but adds execution of SOQL database language within the Apex language. Apex is designed to run within the Force.com platform, and it enables developers to add business logic to vents, buttons, triggers and Visualforce pages. As a developer, you may develop Apex code in the Salesforce UI, Developer Console or in the Force.com IDE (Eclipse with force.com plugin). Apex cannot be authored in production environment, so a Dev or Sandbox ORG should be created to author the Apex code. When do you use Apex? Things that can't be done or very complicated to use declarative interface such as Workflow is a good starting point for using Apex code. Also, adding visual interface and handling click events on the Visualforce pages as well as providing Web Service API to external interfaces. The list below is the typical use cases of Apex. 3. Multi-step wizards through Visualforce pages and controllers. 1. Primitive Data Types - Unlike Java programming language, Apex has the following "object"-like primitive data types. Blob, Boolean, Date, Datetime, Decimal, Double, ID, Integer, Long, String, Time (Date and Time data type are essentially the Datetime type with Time or Date portion set to 00:00:00 or 00-00-0000). *Note: A string is enclosed in a single quote like 'Web Traffic Exchange' which is different than Java's double quote. 2. Objects - sObject is the parent class of all standard and custom Apex objects. 3. Collections - Collections include List, Set and Map. List is NOT an array, but it can be referenced as an array. Note 1: By default, Apex classes are NOT extendable so use virtual keyword to make the class extendable. Note 2: Use the override keyword to create a new definition of a method defined as a virtual method in a base class. For more information about Apex Language syntax, please consult Apex Code Cheatsheet. Apex doesn't really have Application, Session or Page scope. Instead, Apex codes are run within the Transaction Scope. A Apex Transaction represents a set of operations that are executed as a single synchronous unit, and also represents the unit of rollback for DML operations. Static variables are transaction-scoped, and they do go out of scope at the end of each transaction. Apex runs within the Cloud, and the platform offers multi-tenancy. To limit a single ORG from consuming large resources, Governor Limit is placed to limit run-time resources each ORG and transactions. Governor Limit monitors platform resources assigned to each ORG such as memory, database and transaction. Governor Limit enables multi-tenancy by ensuring that resources are fairly allocated to each tenant (per their SF License), and terminates Apex execution with run-time exceptions when the limit is reached. For more information on governor limits, please refer Salesforce Governor Limits Quick Reference Guide. The first two things we need to do before we begin our development are (1) update the email address on your profile, and (2) modify the valid IP ranges for the administrator profile. 1. Reset your email address on your Salesforce profile - SF generates various emails for notification purposes. By updating your email address, you will be getting all those notifications. (A) Login to your salesforce account by using (live/developer) http://login.salesforce.com or (sandbox) http://test.salesforce.com URL. (B) Click Your Name | My Settings | Personal | Advanced User Details | Edit, then update your profile details including your email address. 2. Modify the valid IP ranges for the administrator profile. This will enable you to access the Salesforce from whitelisted IP address(es). (A) Click Setup | Manage Users | Profiles | System Administrator. (B) Scroll down to Login IP Ranges and click New. In order to deploy the change from Sandbox to a Production, you'll have to setup Setup -> Deploy -> Deployment Connections. Setup an Inbound connection to Production from Sandbox as shown in the screenshot below. You will also have to SELECT a company in order to transfer change from Sandbox to Production. **Note: This isn't taught in the DEV-541 class, but it was necessary for us to successfully transfer the change without failures. This option is not available on Sandbox. 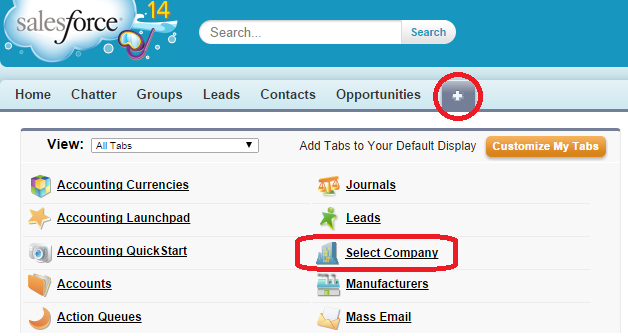 (a) Navigate to + menu on the tab, and click on the Select Company. (b) Select Company screen appears as below. Checkmark the box, and Save. 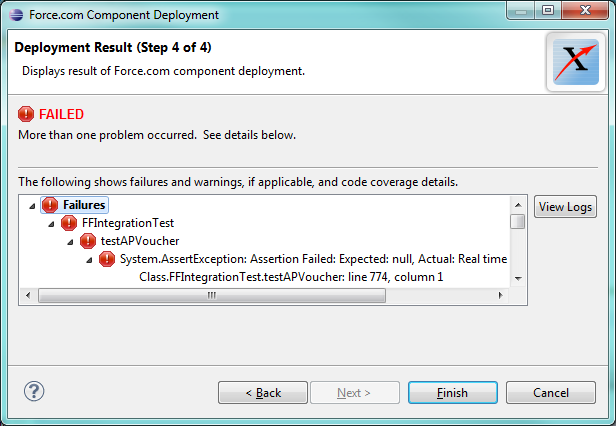 (c) In the case above, the error is from FinancialForce managed package. The package couldn't have deployed if there was an error, so it's possible that the person deploying the new change may not have licenses to managed packages. Please ensure that you have all necessary licenses to carry out the deployment. To verify your licensing requirements, go to Setup -> Build -> Installed Packages. Click on the Manage Licenses next to the Package Name.